When we speak about October 7th, we must acknowledge the importance of its airy nature and the intellectual symbolism behind it. It is a time of communication, distant and new ideas, thoughts and breakthroughs, and could get truly inspiring for those who find their grounding and set free from norms imposed by the society. People born on this date are highly mental types, those who keep too many information in their heads, and need to find a way to manifest their visions and bring their incredible thoughts to life. They are to avoid giving away their power by trying to express themselves in ways that satisfy others, so they can share their brilliant potential with the world in a healthy way. Individuals born on October 7th bring change, reshape our realities and make everything seem different than it has been for a while. Their talents are obvious, but their mind could get overwhelming and too eccentric for others to follow. Overthinking easily becomes the issue that prevents them from living their life in full bloom. Highly social and eloquent, they can become the light of the party, organize large gatherings with ease, and pay attention to the humane approach in situations that include many people of different background and education. The trouble with this row seems to be in the hardship of the Sun around others, especially in large circles of friends and around people that seem intimidating with their wit and successes in life. These Libras are to build inner strength that allows them initiative to light the spark of their own creativity, instead of looking up to anyone else. "In the Heat of the Noon Hour a Man Takes a Siesta"
With the sun in zenith, this man falls asleep, and it is obvious that this symbol speaks of the potent Sun of individuals born on this date, as well as their tendency not to see it at all. Unaware of their strength, they could spend most of their life hiding from their own talents or too tired to understand the force they carry in their authentic personality. Things easily jump out of their comfort zone and seem to push them too far, being too light, too potent, hot and too electric to commit to in the long run. Their moderate nature should allow an adventure or two or a dozen, until they learn that their lives need as much excitement as one can find. 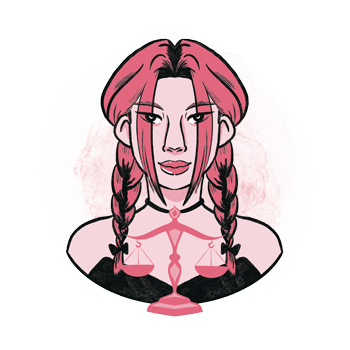 With Mars set as their destination, Libras born on October 7th have a task to find grounding, care for their body, and build up their physical strength enough to be able to conduct all information they gather from above. Their minds are constantly swirling with incredible insights, but in order to bring their ideas to life and make them functional in the real world, they are to think about their routine and find a healthy organization in their everyday life, so they can truly focus on creatively expressing themselves with confidence and willpower. Their task is to release the fear their ancestors left them with, and bravely make steps forwards that are free of any restrictive interpersonal contacts. Emotions and relationships of those born on the 7th of October should be as exciting as their planetary row, filled with friendships and admiration that goes both ways. However interesting and fun, they could get a bit unstable and demanding, stressing them out and throwing them into many mental processes that spin in circles without a solution. They will have a hard time staying put for too long and need a partner to understand how changeable they need to be, beneath their moderate image of Self and the nature they present to the outer world. In search of a good friend they will talk to about their most intimate matters, they could have many relationships don’t fulfill their needs, until they realize what they truly want out of their love life in the first place. Confused about matters of friendship and romance, they seem to mix too many signals that others like to put in drawers. However, if they believe in their senses and open their heart for those who set them free while at the same time making them feel loved, they will find that there is no such thing as "the friend zone", and all fences will fall to pieces. A bit eccentric but trying hard to seem "normal", they are to express themselves openly if they wish to be with someone who sees them for who they truly are. 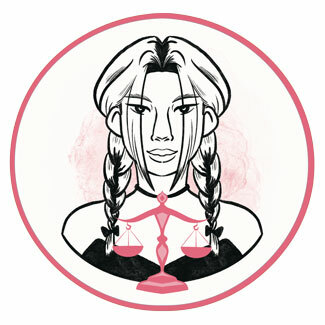 A Libra born on October 7th excels in computer science, programming, astrology, and all modern experiments and research. They are also quite rebellious and can bring freedom to many people if their attitudes are in place and in tune with the rest of the world. They fully grasp the concept of equality in others, but rarely give themselves the rightful position to stand in, as they often fail to see their creative potential as relevant in the vast world they belong to. Rhodizite crystal serves those born on the 7th of October well, as it reminds them of the potent energy waiting within that is just waiting to be used for a higher cause and expressed. This is a stone that magnifies everything in its surrounding with its powerful energetic impact, and it is important to focus on positive thoughts and optimistic views when using it. The law of attraction will prove obvious, for the focus on positive things they want out of life will be evoked by the nature of this crystal. For each Libra born on October 7th a birthday gift is something meant to be surprising. Give them their present a couple of days too early, organize a surprise party, or prepare some fireworks to sweep them off their feet. Although they might get shy in tense situations such as these, they will appreciate the move out of their comfort zone for as long as it is beautiful and loving enough. If this isn’t something you’d consider, then the safest choice of present falls in the realm of technology, a new gadget, a smartphone, or anything they haven’t used that will keep their mind occupied for a while. Interactive, highly social and eloquent, they are the ones to gather large crowds and bring higher thought to those who have been traumatized. They are smart, movable, and able to embrace new solutions with ease and clarity. Their outbursts could become drastic if they restrict themselves in front of others for too long, this leading to theatrical breakups, divorces with no forgiveness or settlement, and other forms of resentment towards those they once cared for. In 1952 Vladimir Putin was born, a Russian politician and colonel and the 4th President of Russia, during whose presidency the Russian economy grew for eight years straight. He cultivates a tough guy image, engaging in extreme sports, interaction with wild animals and different dangerous acts. In 1967 Toni Braxton was born, an American singer, pianist, songwriter, actress and philanthropist who achieved extraordinary commercial success with the song "Un-Break My Heart". She attended university to obtain a teaching degree but decided to sing professionally after she was discovered while singing to herself as she pumped gas. In 1968 Thom Yorke was born, an English singer, songwriter and guitarist, best known as the lead singer of the band Radiohead. Critical of major labels and the music industry, he has pioneered alternative music release platforms such as BitTorrent and pay-what-you-want. 1868 – Opening day ceremonies are held at Cornell University. 1919 – The founding of KLM, the oldest airline that is still operating under its original name. 1950 – Missionaries of Charity are established by Mother Teresa (born on August 26th). 1959 – The first photographs of the far side of the Moon are taken by a Soviet probe. 1996 – Beginning of broadcasting of Fox News Channel. 2008 – The first time that an asteroid impact is detected before it entered the Earth's atmosphere.